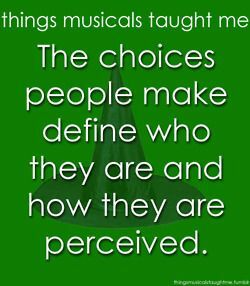 What I’ve learned about Academic Advising from Wicked. Back in October I wrote this post about Wicked and my feelings regarding Academic Advising. Today I want to take that one step further and pen out my Personal Advising Philosophy…what I do and why I do it. 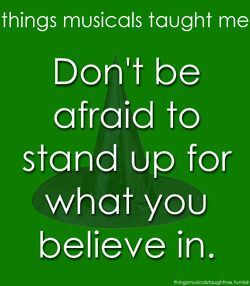 I used Wicked as the theme before, and I am going to continue that. I believe in Appreciative Advising, the six phase framework developed by Jennifer Bloom et al. in 2008. The six phases are: disarm (first impression! ), discover (strengths, skills, and abilities), dream (hopes and dreams), design (plan of action), deliver (taking responsibility/providing support), and don’t settle (encouraging improved performance) – see “Appreciate Advising” by Jennifer L. Bloom, Bryant L. Huston, and Ye He in the 2013 book Academic Advising Approaches by Jayne K. Drake et al. This framework is the guiding premise of my advising philosophy. The Appreciative Advising framework is accompanied by a belief in the need for the development of self-efficacy in all individuals. Alfred Bandura and his Social Cognitive Theory developed the idea of a self-efficacay theory. The basic concept is that each person can develop positive or negative perceptions of his or her ability to reach a specific goal. I believe that academic advisors must work to develop a positive sense of self-efficacy in students improving not self-confidence, but their perceived ability to reach specific outcomes. 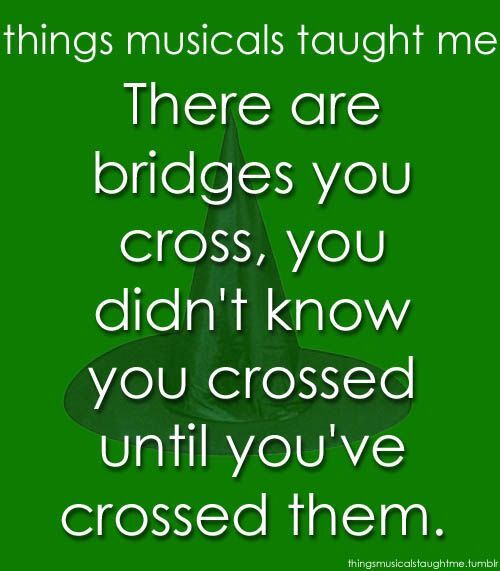 So what do these things have to do with Wicked? 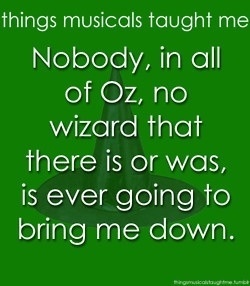 The story of Elphaba and Glinda is truly one of the development of self-efficacy. From doubt and dissension both women develop into powerful creatures. Elphaba, down trodden and neglected, has no self-worth. She has goals, but no real belief that she can reach them. Glinda is full of self-worth; she knows she is important and popular, but she isn’t fulfilled in a meaningful way. Together they are challenged, they face difficulties and real-life road bumps, they discover that they are capable of so much more. They change one another by challenging one another. In the end, they both know that they are capable of working toward their hopes and dreams; they believe in their abilities. In my philosophy, Appreciate Advising and Self-Efficacy walk hand in hand, creating something that’s truly wicked! 1. Advising is about relationship building. Every day in life and each interaction we have with a person impacts us. They call conversations an “exchange” because they are two-way dialogues in which you give and receive. Academic Advising is about developing relationships with students. It is the effort to convey to each student that they matter, that I am there to help them set and achieve goals, that I believe in their success. At the same time, I recognize that with a population as large as the one I have, I can’t build a personal relationship with each young man or woman I meet. That means I must take advantage of every moment knowing that even one word, one smile, one explanation can be the only one they ever have with me. It must be meaningful, authentic, and positive. Because what I say to my students will change them and me. I want that change to be for the good. 2. Advising is teaching, specifically teaching regarding decision making. Students come to academic advisors for help in determining appropriate paths toward a desired degree. This can mean different things for different advisors and different departments. Regardless, I can’t effectively advise my student without encouraging and teaching them proper decision making skills. Advising is about deep, in-depth questioning. That type of questioning leads to reflection and analysis of situations and selves. Societal impacts dictate that the decisions we make can define us. Academic advising is about guiding students to recognize the importance of informed decision making academically and helping them to transfer those decision making skills into the real world as well. I believe that in academic advising student learning outcomes should be made specific and assessable measures should be a primary focus of all advising interactions. 3. Advising is a willingness to help pick up the pieces. Sometimes academic advising is about helping a student to pick up the pieces. That means that at times I am part course catalog, part counselor, part career advisor…the list goes on and on. My job is to be a supportive person when at times a student has no one else. My job is to listen with compassion and concern. My job is to help develop a plan of action. My job is to be brutally honest when others won’t be. I’m not an academic advisor to sugar coat things. I am an academic advisor to actively help students to solve problems. Sometimes that means finding some way to mend a broken bridge. Other times that means building a new bridge over a river and trying again. 4. Advising is belief that anyone can defy gravity – even me! Advisors see students who are positive and up-beat, goal-oriented and focused, beaten-down and discouraged, crushed and unconfident. As an advisor, regardless of the difficulties and stressors and repetition, I must find the positive for each student. Even in handing them terrible news, I must work to help them understand how to set goals and develop action plans which can help them to soar. I must not be limited by my own doubts, my own self-efficacy issues. I must be honest, be me, in order to help students learn not just about college but about life. I believe in Appreciative Advising in a manner which emphasizes self-efficacy development. I believe in the utilization of effective and intrusive questioning techniques to encourage students to become critically aware of their situation. I believe in self-reflection as a form of self-assessment. I believe in stability and flexibility as each student and scenario is different. I believe that I can make a difference.